Colin Cheer claimed 5-35 for Bourne at Grimsby. It was celebrations all round for the Cheer siblings yesterday (June 24). While paceman Colin Cheer was claiming 5-35 to help in-form Bourne complete a 91-run Lincs Premier Division win at Grimsby, brother Jonathan was smashing 160 for Boston in their 70-run win in the day’s big relegation battle at Spalding. Dave Gillett top scored with 58 for Market Deeping at Grantham. Boston’s success moved them out of the bottom two. The relegation places are now occupied by Market Deeping - 82 run losers at Grantham yesterday - and Spalding who meet at Outgang Road next Saturday (July 1). Bourne grafted their way to 193 on a tricky pitch to set up a sixth straight win. Rob Bentley led a steady batting effort with 48. Jonathan Cheer dominated Boston’s 284-4 before Spalding replied with 214-9. Jonathan Miles (55) and Ben Smith (53) batted best for Spalding and the former’s bowling figures (3-26) also stood out. Grantham piled up 291-6 in their 50 overs against Deeping. Former Notts professional Matthew Dowman turned out for his hometown team, making 60 and bowling a tight spell as Deeping responded with 209-8. Dave Gillett’s sedate 58 led the Deeping innings after a speedy 33 from skipper Dave Sargeant. 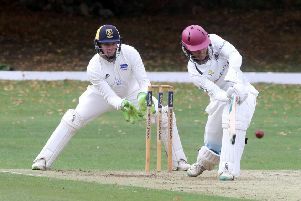 Deeping included Newborough paceman Vamshi Parvataneni in their line-up, but the man who claimed 9-16 for the Bulls last weekend (June 18) found the step up in standard too great and conceded 101 runs in 14 overs. Grantham 291-6 (D. Webb 105no, M. Dowman 60, R. Barnes 2-12, A. Sharp 2-37). Market Deeping 209-8 (D. Gillett 58, D. Sargeant 33, R. Barnes 28, R. Witt 20). Bourne 193 (R. Bentley 48, J. Berry 34, Q. O’Connor 33, J. Temple 28). Grimsby 102 (C. Cheer 5-35). Boston 284-4 (J. Cheer 160no, F. Haffejee 70, J. Miles 3-26). Spalding 214-9 (J. MIles 55, B. Smith 53, D. Millgate 32, C. Dring 20, T. Baxter 4-46).